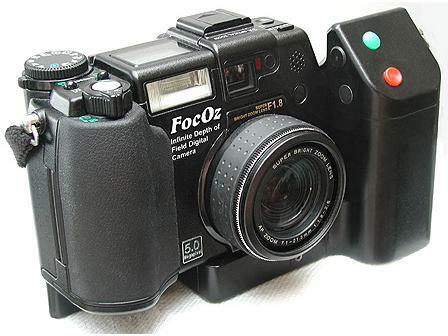 What is a FocOz Camera? The FocOz® camera system can solve a big problem for you! It produces professional quality photos with extreme Depth of Field. It means high image definition all over the picture, i.e. from nearest foreground objects and up to the horizon. You may also portray persons at different ranges - all showing up with optimal definition on the resultant photograph. The FocOz camera is thus solving an old fundamental problem of photography, namely how to keep the whole scene in optimal focus - on a single photo. It's a FocOz camera on the pictures below! It consists of a modified high performance digital camera, which works 'normally' except for the focusing. An additional high-tech electronic unit with its own microprocessor is added and integrated, converting the standard camera into a slave unit with regard to focusing. A sequence of differently focused frames is automatically exposed, and it goes fast: 0.3 second intervals in between the 5-Megapixel shots. The FocOz micro-processor is running the focusing step motor inside the camera very accurately, so that focusing takes place precisely during the short interludes in between exposures. It even awaits a coming refocus if exposure times are prohibitively long. 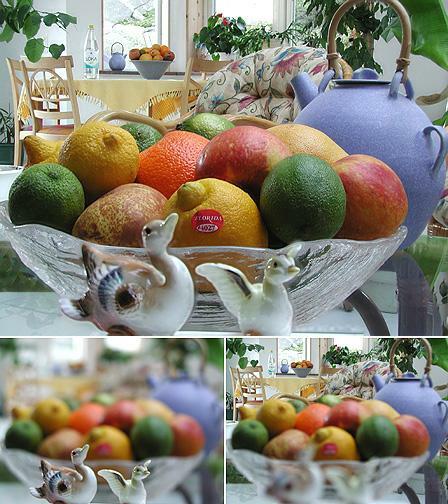 An even more important part of the system is a recently developed computer program which processes these shots: The best- focused image 'parts' from the sequential frames are identified and merged into one single photo with superior depth of field. The new auxiliary electronic housing is sturdy: Machined from solid aluminium and is designed with the professional in mind: The extra handle - containing batteries for dedicated FocOz electronics - is transforming the original consumer camera into something much more sophisticated - it can be grasped and held conveniently with one or two full-grown hands. The feeling is metal and it's just heavy enough to stabilize your hand-shake when operating by free hand. And for the frequent outdoor photographer: An optional add-on magnifying glass shuts off sun stray light from the LCD presentation screen. (We all know how hopeless these screens are when 'blinded' by sunshine - don't we?). The camera is provided with a unique Focus-Memory. You may focus the camera like normally onto various objects by operating its Autofocus (AF) or Manual focus (MF) functions. Having done so, you may save a particular focus setting in the Focus-memory , by pressing the Green 'Save' knob. This done, it stays there in memory and you may now aim the camera against some other object to focus upon. And you may repeat this procedure until you have saved up to 8 differently focused frames, being the maximum. Want to redo the focusing? Just press the red reset button below the green one and start from the beginning again! Focusing done! Time to make the shot: Decide about the final image composition - aim the camera and press the 'normal' camera shutter button once - just as for any other camera. A fast and automatic sequence of differently focused shots, of the same scene, will now be executed. The focus for each frame corresponds to a focus you've just put in memory. The camera 'knows' how many focuses (i.e. frames) you have in memory, so don't worry about that. It will execute them all, one by one (keep the camera still! ), after one single press-down on that knob. The maximum 'speed' will be something like 3 frames a second. (Giving full size, i.e. 5 Megapixel jpg pictures). And then: Same focuses remain in memory, so you can make a second shot ... and a third one. Or you may decide about a fresh start with a new motif? Press the red Reset knob and redo the focusing. Indicator lights will always tell you how many focuses you have in memory. Free hand photography is quite feasible and mostly a success even with maximum tele lens plus tele-converter. It's because the FocOz system compensates for your occasional handshake and misalignments in between those successive exposures ... and it works! So you've now finished taking shots and want to see the results? Well, you have to transfer these photos to your computer, with the camera 'standard' software, just as you have been used to do in the past. You are furthermore provided with a highly sophisticated FocOz processing program on a CD disc for installation on your computer (Windows 2000/XP). (Hardware requirements) It's easy to use. In fact, the only thing you may have to do, is to address the particular frame sequence you want to process. Then: Click the 'Process' button and wait a minute or two, using a standard computer (PC) with - say - 2 or 3 GHz processor-speed. However the program is more powerful and flexible than that: Certain 'difficult' motifs may require special processing modes and the FocOz program provides you with tools to optimize such photos. The automatic program is comparing different frames, selecting image elements of high definition from them all and rejects whatever is blurred. The processed photo becomes a mosaic of the selected image parts. The final result is often treacherous! Like the Still Life composition below with centimeter-size Ducks at the front, 20 centimeters from the camera lens while the rear window is 7 meters away. It's a 5-frame FocOz tele-shot at F/2.8. You won't have to retouch the 'successful' pictures. However, success rate does vary, depending upon how 'difficult' pictures you aim at. A properly tuned studio set up for product- or even portrait photography should for example give you a success rate approaching 100%, while unrehearsed outdoor shots against the light, super-close ranges, or press conference scenes exhibiting significant movements, may bring down your success rate to 50% and even less. Our own statistics from many hundred shots, of all kinds (indoor and outdoor, winter and summer, macro, portraits, landscapes ... you name it) gave success rates around 70 - 90% depending upon the number of frames being processed. Two-frame-shots are generally the most successful ones. However many "failures" only require a mild 10 minute 'fresh up' retouch in order to qualify as 'good'. No retouch was attempted on the adjoining demonstration pictures, featured on this website.